Brook Andrew (1970- ) is a Sydney born/ Melbourne based interdisciplinary artist of Wiradjuri and Scottish heritage. Andrew's conceptual based practice incorporates, sculpture, photography, installation, video and performance. The 'Replicant' 2006 series reflects (literally) upon the act of looking, and consequent interchanges between nature and culture, subject and object, real and represented. These dualities fit broadly within the artist's addressing of Australian identity, polemics and the politics of difference. For the 'Replicant' 2006 series Andrew borrowed taxidermied specimens from the education department at the Australian Museum, Sydney. These included native species of indigenous significance such as an owl, possum, flying fox and parrot. He shot each animal - artificially propped in their natural poses - and digitally manipulated each image so as to appear duplicated, a process that evolved out of the 'Kalar midday' 2004 series. 'Parrot' 2006 presents two identical birds with wings in full span facing one another. The parrot is an important subject for Andrew given the bird's association with mimicry but also its exotic status. Its black background evokes a sense of nocturnal and a 'kind of dreaming power' however the spot lighting and high detail bring to mind stuffy ethnographic displays in museums. This framing of the parrot as an object of study is a 'soft' analogy with the historical imagining and representation of Aboriginality as primitive or 'other' in a Victorian/ colonial context. 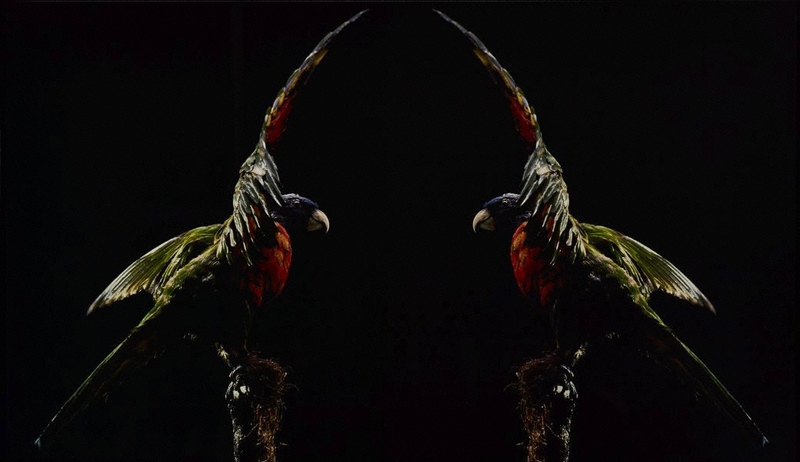 Nonetheless, in duplicating Andrew disarms this endeavour; the parrot does not confront our 'gaze' but is enamoured with its own reflection, inverting the power play of viewer and viewed through a baffling sense of uncanniness. Australian art collector , 'Brook Andrew', pg. 104-109, Ultimo, Jan 2008-Mar 2008, 106 (colour illus. ).